Broadway In Chicago is thrilled to announce that individual tickets for the all-new production of JEKYLL & HYDE go on-sale to the public Friday, Jan. 11, 2013 at 10 a.m. JEKYLL & HYDE will play the Cadillac Palace Theatre (151 West Randolph St.) for two weeks only, March 12 – 24, 2013. 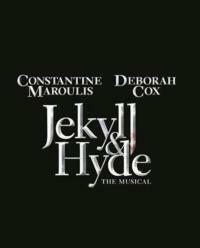 American Idol star and Tony Award nominee Constantine Maroulis joins with Grammy Award nominee and R&B superstar Deborah Cox to inject new life into the classic tale of good and evil, JEKYLL & HYDE. After four thrilling, chilling years on Broadway and multiple world-wide tours, this dark and dangerous love story from Tony and Grammy Award nominee Frank Wildhorn and Oscar and Grammy winner Leslie Bricusse, returns in a stunning new pre-Broadway production directed by Tony nominee Jeff Calhoun and includes all the classic songs (This is the Moment, A New Life, Someone Like You) that first grabbed audiences by the throat and transformed JEKYLL & HYDE into a theatrical phenomenon. Also starring in the production are Teal Wicks (Wicked) as Emma Carew, Laird Mackintosh (Mary Poppins) as John Utterson, Richard White (Most Happy Fella) as Sir Danvers Carew and David Benoit (Avenue Q, Les Miserables) as Bishop/Spider. Rounding out the cast are Stephen Mitchell Brown, Jerry Christakos, Dana Costello, Wendy Fox, Brian Gallagher, Sean Jenness, Mel Johnson Jr., James Judy, Ashley Loren, Courtney Markowitz, Aaron Ramey, Emmy Raver-Lampman, Rob Richardson, Blair Ross, Doug Storm, Haley Swindal and Jason Wooten.